Krakow Catholics Have a New Shepherd. Pope Francis has appointed Archbishop Marek Jedraszewski to succeed Cardinal Stanislaw Dziwisz as Metropolitan of the Krakow Archdiocese. Until recently Archbishop Jedraszewski, 67, was Metropolitan of the Archdiocese of Lodz, the industrial city in central Poland. Until his elevation in 2012 to the rank of archbishop he managed to combine careers of a Catholic prelate and a university philosophy professor. In Poland Archbishop Jedraszewski has a reputation as an outspoken conservative. His predecessor as the head of the Catholic Church in the Krakow region, Cardinal Dziwisz, has retired at 77 – he is best known for his role as the closest aide to Pope John Paul II. New Year’s Eve, Somewhat Pruned. 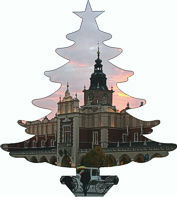 The municipality of Krakow scales down New Year’s Eve’s traditional celebrations in Rynek Glowny central square. An open-air dance party with DJ Charlie and XXANAXX electronica act on January 31th, 2016 replaced the usual long concert with a lineup of pop stars. And no fireworks display either. There will be also alfresco celebrations in two of Krakow's uptown areas, namely Nowa Huta and Podgorze districts. The former lures revelers to a show featuring covers of seasoned pop hits by the Teatr Ludowy theater. The latter hosts a sort of pop music show in Rynek Podgorski square. This year Xmas street decorations in Krakow are Art Deco themed, white and silver lights prevailing with bits of navy-blue, green, and red. Expect ornaments in the shape of stars, balls, and snowflakes. They will stay in place till January 31, together with three Christmas trees – two of them ten-meter-tall firs and one measuring 15 meters in height. The Rynek Glowny central square, where the Krakow Christmas markets take place, gets the tallest conifer, decked with some 40,000 LED lights. Plus eleven giant angels made of LED lights adorn varied parts of the city, six of them standing in the middle of crucial traffic circles. And for the first time computer animations, projected from the Town Hall Tower, are meant to additionally enliven the central square. Krakow mayor Jacek Majchrowski narrowly escaped a no-confidence referendum thanks to August 10, 2016 ruling of the local election official to void 38,919 signatures to a petition to remove him from office. The remaining 48,323 valid signatures proved 9,696 short of the minimum number required to call a plebiscite to dismiss the incumbent mayor. Termination of the highly publicized motion ends a lengthy campaign that was electrifying the Krakow local politics for months. It was the first serious attempt to remove 69-year-old Mayor Majchrowski in his fourth term in the office. The abortive crusade was led by 39-year-old Lukasz Gibala, an entrepreneur turned left-wing politician, who privately is a nephew of Jaroslaw Gowin, currently the Deputy Prime Minister in the far right government of Poland. In November 2014 Mr. Gibala, then an incumbent MP, ran against Mr. Majchrowski and six other hopefuls for the mayor of Krakow and came third in the poll with 11 percent of the vote. World Youth Day in Krakow, 2016. EURO 2016 European Handball Championship took place in Krakow from January 15th to January31st, 2016. Germany won gold, Spain silver, and bronze went to Croatia. The city hosted the final, semis, and the competition for third place as well as some other games including all matches of Group A that consists of Poland, France, Serbia, and Macedonia. Besides Krakow three other Polish cities co-host the championship: Katowice, Wroclaw, and Gdansk. World’s Best Volleyball in Krakow Again. The 2016 FIVB Volleyball World League Final Six tournament takes place in Krakow from July 13th through July 17th. The Krakow event crowns a series of 27 tournaments played on six continents by 36 national teams divided into three groups. The best five squads plus Poland as the host qualify for the World League Final Six in Krakow. The tournament venue, Tauron Arena, can seat 15,000 spectators. City council have passed a motion to radically expand the existing paid parking zone. The zone covers practically the entire downtown Krakow, including the historic Podgorze district on the right bank. Parking a vehicle on any street in the area costs three zloty (PLN) for the first hour and more for subsequent ones. The city hall expects the proceeds from the inflated zone will amount to an equivalent of four million euro a year. Previously paid parking in the street applied to Krakow’s two central historic districts, Old Town and Kazimierz, where most of the city’s tourists attractions is situated. Copyright © 2016 by MAREK STRZALA. All rights reserved.